9 a.m. - 11.30 a.m.
2 p.m. - 4.30 p.m. The rope slide par course through the Kesselfall gorge in Kleinarl offers you an unforgettable natural experience. You can get to the starting point of the tour via an easy, medium or difficult fixed-rope route (via ferrata). After that you go over five rope slides, two waterfalls and over a rope bridge back to the valley. The highlight is the over 100-meter-long rope slide at the end. What you can expect from this experience is fun, action and adventure! The rope slide par course through the Kesselfall gorge in Kleinarl offers you an unforgettable natural experience. You can get to the starting point of the tour via an easy, medium or difficult fixed-rope route (via ferrata). The guided Kesselfall tour with the ropes course continues on for an additional two hours after the initial climb. 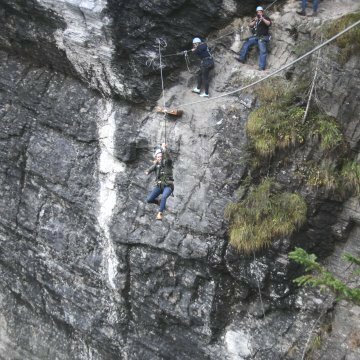 You go via the fixed-ropes route (via ferrata) to the high ropes course, where you can test your skills and courage on five par courses. At the end you go down the rope slides into the valley to our starting point. Join us in discovering your passion for bicycling. Whether you choose the guided tours with the E-bikes (from age 12) or the trial training in Bikepark Wagrain (from age 10), professional guides will lead you across our trails.